If you’re eating a more Paleo or Whole30 diet, on the go foods can be hard to find. It took me years before I heard of Simple Mills foods, I wish I would have known about their products a long time ago! They make the best gluten-free/Paleo-friendly crackers I’ve had (and I’ve tried them all) plus delicious cookies, baking mixes, frosting (just used this for my son’s bday party and it was amazing) and more. 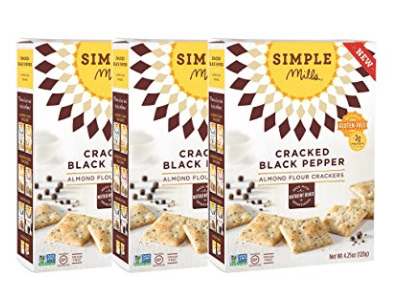 If you buy them at regular price, they can be pricey, so I’m excited to see a brand new 20% off Simple Mills coupon over on Amazon! You can use the coupon on one of 20 Simple Mills products. You can stack this coupon on a lot of the items listed with the 5-15% off Subscribe and Save savings for an even bigger discount. I was able to get the Simple Mills almond flour crackers for just $3.10 a box by stacking the coupon with my 15% off Subscribe and Save discount (these normally sell for $5+ in stores)!